A lot of you had asked my opinions on these two resources. I am not an infant teacher at the moment, so I do not use either of them. I did however ask the respective book companies, Folens and Edco for a trial of these resources to enable me to do a fair review for you all. I also attended the Edco Expo on Bua na Cainte last spring. Edco attended my seminar during the summer and their rep Clare McKenna gave us a demonstration of the programme. Folens also attended to give a demonstration, so I saw a little bit of both programmes in action. I will begin with Bua na Cainte. Bua na Cainte is a complete Irish scheme for junior infants- second class. My sister teaches junior infants- second class and she has started using Bua na Cainte this year. She absolutely loves it, and says it is the best scheme she has used to date. She says it really brings Irish to life in the classroom. I would be inclined to agree. I found it to be very accessible when I was trialling it. The teacher resource book is excellent. It is very comprehensive and has very detailed plans. It literally tells you what to teach step by step! The programme is broken down into themes. Each theme has a task at the end to revise the content of that theme. 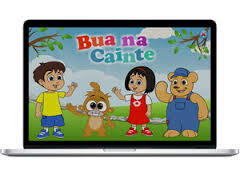 Bua na Cainte is a complete on-line digital resource, as in you can teach the whole Irish curriculum without buying the student workbooks at all. Everything you need is in the online content. It also comes with flashcards, pictures, communicative cards, bingo cards, masks and finger puppets, and a wide array of posters. The main selling point for me with this programme is the colourful and eye catching digital resources, and the characters. I love them! There is a lot of repetition too in the stories which is so important in Gaeilge. I also love the songs and games. There’s a wide selection of songs and poems for each theme. I would recommend keeping an eye out for the next Expo to see a demonstration of the programme, as this is what piqued my interest in it. Abair Liom is Folen’s newest Irish programme, and this it’s first year so it is still in its infancy. I was lucky enough to be given the teacher resource book for this plan. It is huge! It has yearly plans, monthly plans, fortnightly and daily. It is so very detailed. These are available in editable format online too. The plans show you what to do step by step for each lesson. 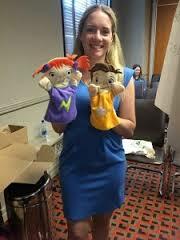 It also comes with two lovely little puppets which I have! Abair Liom gives a unit per week, which I like as you don’t need to stretch out a topic over a few weeks with it. The posters and pictures in Abair Liom have lots of detail and give huge scope for discussion, questioning and oral language. 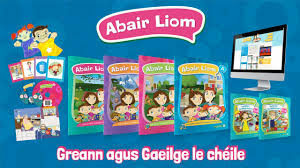 Abair Liom also have a feature where there is a link to a website for parents where they can listen to the vocabulary and structures that the children are learning to encourage greater involvement at home. Both resources are quite substantial in my opinion. I would need to actually use them in class really to see the children’s reactions to them, but just from using them myself at home I would rate both programmes quite highly. Personally, I prefer the characters in Bua na Cainte, and the games, but then Abair Liom has the puppets which are great for extending the lesson outside of the online resources. I would recommend going to expo’s on both before buying a license for your school, then you can make an informed decision.